Though the film nakedly seeks a wide audience through conventional plotting and characterization—and despite being (like most action movies) guy-centric—Shanghai Noon provides good, clean 'family' fun. 111 min. Buena Vista. Director: Tom Dey. Cast: Jackie Chan, Owen Wilson, Lucy Liu, Xander Berkeley, Jason Connery, Walton Goggins. Look, Shanghai Noon isn't Shakespeare. But I'm just a sucker for Jackie Chan movies. 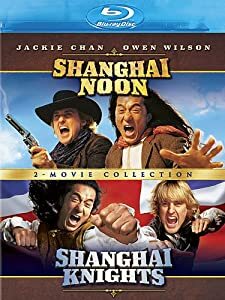 And as one of Chan's best Hollywood pictures, Shanghai Noon benefits from a big budget and an assist from Owen Wilson in filling out the running time between the fight and stunt sequences. Director Tom Dey may not have gone on to great things (Marmaduke, anyone? ), but in his feature debut, he keeps the unpretentious, essentially old-fashioned entertainment moving quite nicely, and anyone who knows Chan knows that he and his stunt team shadow-direct the action sequences anyway: Dey's job was to put on screen Alfred Gough & Miles Millar's screenplay, which essentially follows the same uptight-versus-loose odd-couple buddy-comedy paradigm that worked for Chan two years earlier in his Hollywood success Rush Hour. Chan plays Chon Wang (a name chosen for a phonetic play on "John Wayne"), another in the actor's line of winning underdogs. An Imperial Guard who can't get any respect, Wang sets out from the Forbidden City in pursuit of Princess Pei Pei (Lucy Liu), who has been, um, shanghai'd to Carson City, Nevada. Wang is, of course, the archetypal fish out of water, but he's both honor-bound and fiercely determined to overcome every obstacle between him and Pei Pei. The obstacles include Wang's evil countryman Lo Fong (Roger Yuan), American man-in-black Marshal Nathan Van Cleef (Xander Berkeley), and unhinged gunman Wallace (Walton Goggins), but the one Wang can't seem to shake is Roy O'Bannon (Wilson), a train robber who's less threatening than bothersome in his refusal ever to take "no" for an answer. Chon and Roy become somewhat wary teammates, tied in part by their mutual status as outlaws (the "Wanted" posters dub Chon "the Shanghai Kid"). One either finds Wilson amusing or annoying, but I'll take his comically meandering drawl over Chris Tucker's fingernails-on-a-chalkboard delivery any day. Wilson also has a good chemistry with Chan, the film's true international star. Chan has a number of the nifty, witty fight scenes that are his stock-in-trade, including through and atop a train (shades of Buster Keaton), in the woods (using branches for props), and in the film's climax in a mission church affords opportunities with ropes, planks, and a bell (Chon also makes use of that old kung-fu standby, the queue hairstyle). The location photography is quite lovely, and though the film nakedly seeks a wide audience through conventional plotting and characterization—and despite being (like most action movies) guy-centric—Shanghai Noon provides good, clean "family" fun. Disney delivers another satisfying Blu-ray two-fer with its single-disc release of Shanghai Noon and Shanghai Knights. Picture quality shows a marked improvement over the previously issued standard-def DVDs, and this release retains all previous bonus features, so hi-def fanatics have a solid impetus to upgrade (casual home-video watchers who already own these titles have less of a motivation). Given the picture's replay value and the nice-pricing, first-time adopters should definitely take the plunge. The HD presentation of Shanghai Noon isn't on par with a new-release digital transfer, but it quite serviceably gets the job (of yielding greater detail and truer color than standard-def DVD) done. Black level impresses, and aside from the rare speck of dirt, the source is clean, sharpness and color waver from time to time, but on the whole, this is a solid catalog transfer marking a noticeable upgrade over the previous DVD release. Audio gets "the budget treatment" with a lossy Dolby Digital 5.1 mix that's going to disappoint HD audio nuts; still, to everyday ears—and graced with a high bit rate—it's still a clear (in dialogue) and reasonably robust (in action and music) rendering of the original soundtrack. Bonus features in the Shanghai Noon area of the disc include audio commentary with director Tom Dey and actor Owen Wilson with spliced-in comments from Jackie Chan. This proves an entertaining listen, particularly for fans of the stars and those seeking a bit more production insight. Eight "Deleted Scenes" (SD) come without benefit of a “Play All” function. Production Featurettes—including behind-the-scenes footage and talking-head clips of Dey, Chan and Wilson—comprise "Making an Eastern Western" (3:23, SD), "Partners" (4:09, SD), "Jackie’s Comedy" (3:48, SD), "Western Stunts, Eastern Style" (3:39, SD), "Hanging with Roy and the Kid" (2:16, SD), "Action Overload" (2:41, SD) and "Choo Choo Boogie" (3:09, SD). Rounding out the Shanghai Noon extras are the "'Yeah, Yeah, Yeah' Music Video" (4:09, SD), performed by Uncle Kracker, and the "Theatrical Trailer" (1:18, SD). All site content © 2000-2019 Peter Canavese. Page generated at 04/24/2019 07:48:39AM.